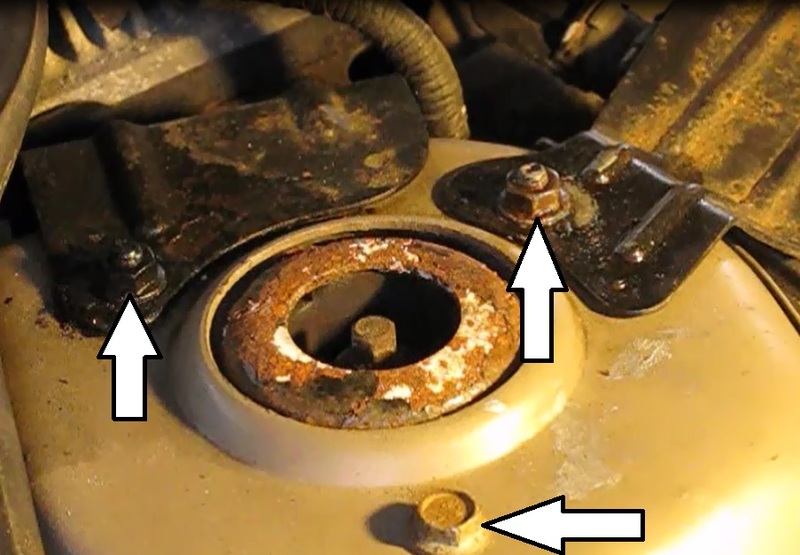 On a test drive after replacing the timing chain on a 2003 Chevy Cavalier, there was a metallic "thunk" sound when the wheel was turned to the right. The right front side was also 3/4" lower than the left. 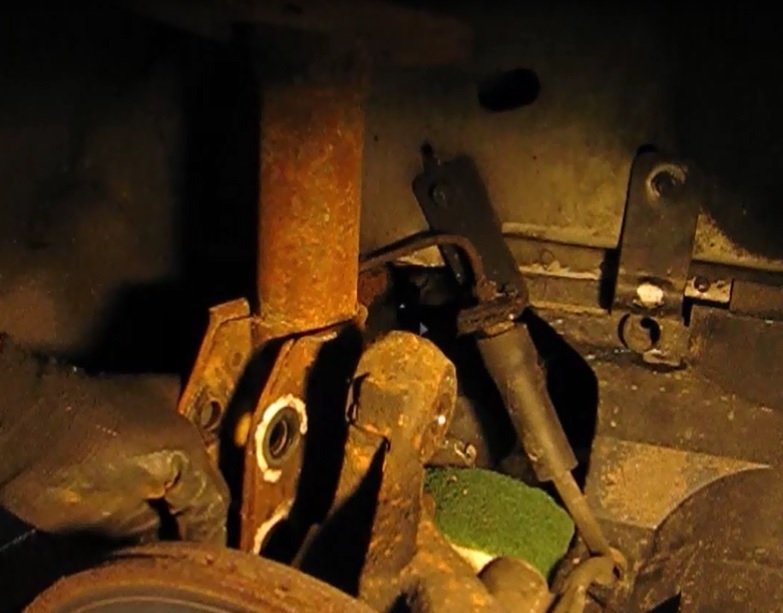 We jacked it up and took off the wheel and found that the strut spring had broken. 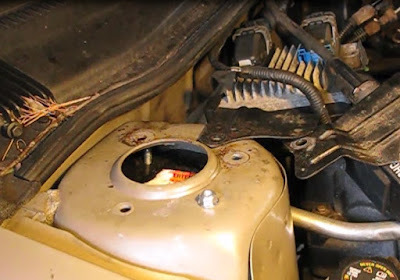 This post will cover replacing the broken strut with a Monroe Econo-matic strut assembly. This is not a difficult job for the home mechanic. This procedure should apply to many similar GM small cars made between 1995 and 2005. After completion the front end alignment should be checked. Materials: protective material for inner CV boot. I used a kitchen sponge. Time: 1- 1 1/2 hrs. 1) Break the lug nuts, jack up the front of the car and set down on stands. Remove the wheels. 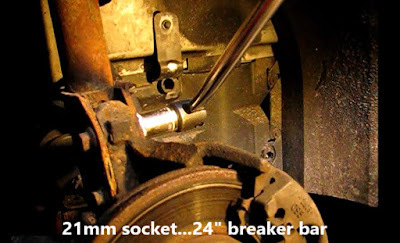 2) Unbolt the two 21mm nuts fastening the lower part of the strut assembly to the steering knuckle. 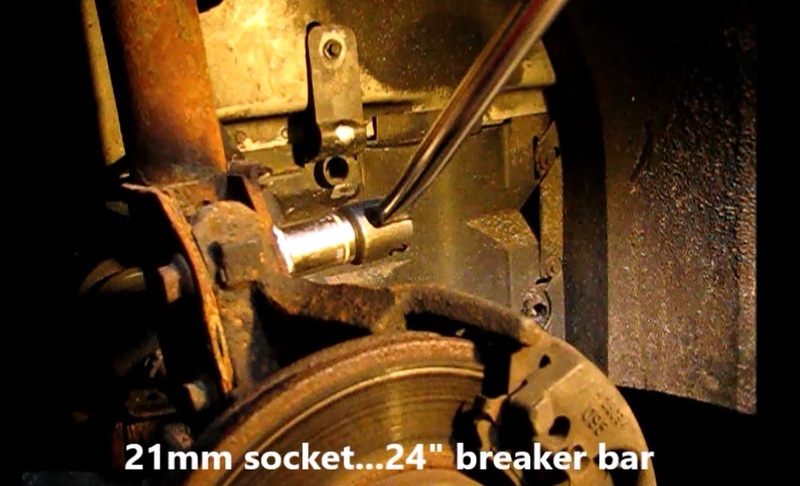 This is highly torqued bolt, so use as large a breaker bar as have. Remove the nuts. 3) Use a punch to tap out the bolts. These are serrated and lock into position. 4) Place a cushioning, protective material between the bottom of the strut and the outer CV boot. This will protect the boot from damage from the strut when it comes down. 5) Unbolt the strut from the strut tower. There are two 13mm nuts and one 10mm bolt fastening it. When removed the strut should drop down, but if it doesn't tap on the studs to knock it loose. 6) Remove the strut from the car. It will slide out toward the rear of the car. It is often necessary to push down on the rotor and knuckle to give room to get it out. 1) With a protective material over the outer CV boot, lift the new strut in from the same side the old one came out. Push the studs through and fasten. A helper is very good to have here, at least until the strut is fastened loosely to the strut tower. Get at least the inner two studs fastened with the nut on two or three turns. On the passenger side there are several parts sharing the strut mounting position on top of the tower. Move them aside as the strut is brought through and then place them back in position. 2) Now position the strut over the steering knuckle. This can be a bit of a struggle. It may help to turn the steering wheel a bit to get it into position. Push downward on the wheel to get the knuckle low enough to receive the strut. 3) Push a strut to steering knuckle bolt through and then the other. Tap them with a hammer to force the serrations into place. Turn on the nuts. Here is where you can try to duplicate the relative position of the new strut to the painted marks made on the old. With Monroe there is no room for adjustment as they have a raised ridge on their strut that precludes adjustment. 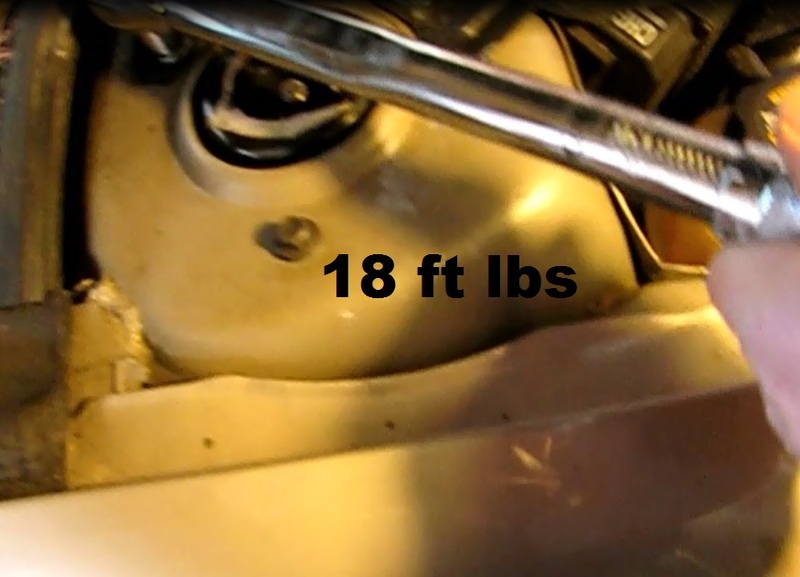 4) Torque the 21mm nuts to 133 ft lbs. 5) Torque the upper 13mm nuts and bolt to 18 ft lbs. 6) Repeat all steps on the other front strut. 7) Lift the car off the stands, remove them and install the wheel, tightening the lug nuts by hand. 8) Set the car down and torque the lug nuts oppositely, and in stages to 100 ft lbs. 9) Test drive. Take the car for an alignment check and adjustment if needed.